Recently, while researching learning spaces to support modern literacies, I came across an interesting term that I was unfamiliar with, heutagogy. Heutagogy is the study of self-determined learning. Introduced in a report by Stewart Hase and Chris Kenyon, heutagogy emphasizes skill competencies, primarily learning how to learn. Heutagogy also relates to the concept of life-wide learning by acknowledging the learner's opportunity to profit intellectually from authentic experiences and settings. Unlike pedagogy and andragogy, which place an emphasis on instructor control and direction, heutagogy is indeed learner orchestrated. As information becomes more readily available, providing students opportunities to assume more responsibility for their learning, the role of the pedagogic instructor shifts to that of a facilitating lead learner providing advice, resources, and encouragement. Over the past few years, my interest in educational disruption has grown to the point where I have been encouraging my teaching colleagues to shift their teaching pedagogies to amplify student-centered learning. I now recognize my ignorance with this concept. Real educational disruption means accepting and supporting heutagogical practices for learners of all ages. What will heutagogy look like in our schools? "It's not about making learning happen. It's about letting learning happen," says Sugata Mitra in one of my very favorite Ted Talks.You will notice that the description of his learning interventions begins pedagogical, but by the end of this presentation, he is clearly describing heutagogy supported with his vision of the School in the Cloud. "With the progress of technology and the rise in mobile learning, now more than ever self-directed learning, or heutagogy, isn't just possible, but natural, and almost awkward to not use..."
Can heutagogy save education? If so, what are the barriers that are keeping heutagogy from becoming an everyday reality in our schools? Education 3.0 and the Pedagogy of Mobile Learning - Jackie Gerstein, Ed.D. Blaschke, L.M. (2012). Heutagogy and lifelong learning: A review of heutagogical practice and self-determined learning. International Review of Research in Open and Distance Learning. 13(1), 56-71. Retrieved from: http://www.irrodl.org/index.php/irrodl/article/view/1076/2113. Hi, great blog. 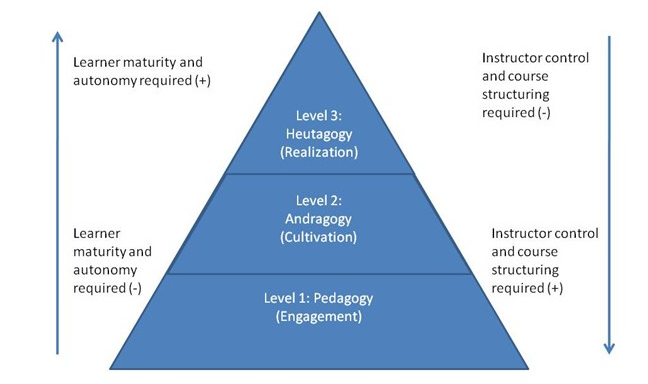 We'd like to think that heutagogy can join in the much needed paradigm for learning for the 21st century. Would like to talk more. Can you come to London for the conference on 6th June this year? London in June sounds wonderful, although I may need your help convincing my wife and bosses to let me go. Thank you for your comment and invitation. I am looking forward to learning more about heutagogy from you. Sorry you won't be able to make it to the conference in June! Would be great to meet in person and talk more about heutagogy.